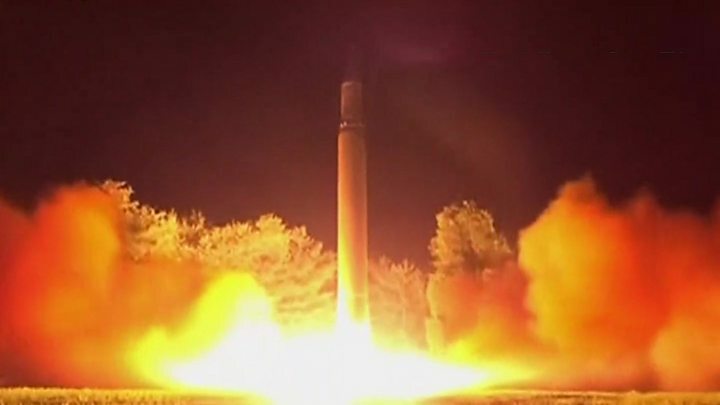 North Korea has hailed as a success its latest test of an intercontinental ballistic missile (ICBM), describing it as a "stern warning" for the US. North Korean leader Kim Jong-un said the test proved that the entire US was within striking range, state media reported. However, experts say many of North Korea's missiles cannot accurately hit targets. The launch came three weeks after North Korea's first ICBM test. The Pentagon said the latest missile was launched at 23:41 (15:41 GMT) from an arms plant in Jagang province in the north of the country. North Korea said the ICBM flew for just over 47 minutes and reached an altitude of 3,724km (2,300 miles). It is unusual for North Korea to launch a missile at night - the significance is as yet unclear. This is the first missile fired from Jagang province, indicating a previously-unknown launch site is operational. The test was condemned by the US and North Korea's neighbours. US President Donald Trump called it "only the latest reckless and dangerous action by the North Korean regime". South Korea said it was concerned the North may have made "a significant advancement in technology", adding that the missile test was "unique in its time and place of launch". Japanese Prime Minister Shinzo Abe said the threat to his country's security was "grave and real". China also condemned the missile test but urged "all parties concerned" to exercise restraint "and avoid intensifying tensions". Pyongyang said the launch had "successfully tested re-entry capabilities" of the missile. Kim Jong-un "said proudly the test also confirmed all the US mainland is within our striking range," the Korean Central News Agency said. The statement said that the rocket was a Hwasong-14, the same model North Korea tested on 3 July. Is ICBM test a game-changer? The North has repeatedly tested missiles in breach of UN resolutions. ICBMs can reach altitudes well outside the earth's atmosphere. Using sharp trajectories with high altitudes allows North Korea to avoid firing over neighbouring countries. Despite the ongoing tests, experts believe the North does not yet have the capability to miniaturise a nuclear warhead, fit it on to a long-range missile, and ensure it is protected until delivery to the target. North Korea's latest ICBM test went farther and higher than its previous 3 July test, meaning that it may be able to strike even deeper into the heartland of the United States than initially assessed. Within minutes of the launch, South Korean, Japanese and US officials reported data about the location, range, apogee, and flight time of the missile. While full analysis has not been finalised yet, several points stand out. First, the data available indicates that the missile may have a range of approximately 10,400km. Since this missile is road-mobile, a launch from the north-eastern city of Rason would put New York City in range of the ICBM. Second, the US reported that North Korea launched the ICBM from Mupyong-ni, North Korea. This location was different from many press accounts leading up to the launch which predicted a Kusong launch. The missile launched at 23:11 local time, an unusual time for North Korea's tests as well. It is possible that North Korea is already experimenting with deploying the missile under the cover of night or setting up multiple launch sites to confuse observers. Reports on Friday said the missile had come down in the sea off northern Japan. In response, the US and South Korean military conducted a live-firing exercise using surface-to-surface missiles, a US defence official said. Does N Korea have the bomb? The missiles were fired into the "territorial waters of South Korea along the east coast," a US military statement said. South Korean Defence Minister Song Young-moo said the country would prepare independent measures to curb the North Korea threat, speeding up the deployment of the Terminal High-Altitude Area Defense system (Thaad) provided by the US. China is opposed to the deployment of Thaad, saying it affects the regional security balance. Has North Korea got the bomb?